It’s time to take a leap of faith. Again. Launch out into the deep. Get out of the boat. ARGH! Why can’t things ever be easy? The unknown is a dark, murky place. 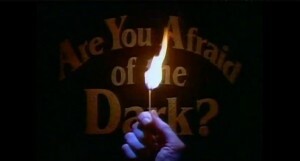 And I’m afraid of the dark! I’ve always been “scary,” ever since I was a child. I grew up watching one too many Creature Feature movies. (And Svengoolie – it’s a Chicago thing!) My brothers didn’t help matters by always trying to scare me. Spooky stuff happens in the dark. It’s the place of “what if?” and all sorts of horrible things that could possibly occur. Nothing good ever happens there. I had cause to rethink that assumption after reading a little blue book, The Secret to Success. It made me see that on the other side of that fear – that very thing you don’t want to do or go through – is where your success can be found. Maybe you’ve tried once before and were defeated. That should’ve been enough to stop you but it merely curtailed you. It slowed you down, yes. But also, it made you more hungry and determined to succeed after you’d gotten back on your feet. We go through and persevere, not because we are unafraid, but because our fear of what many NEVER happen, what we may NOT be able to achieve if we don’t go through it, is greater than our reluctance to tackle the unknown. This thought alone is enough to propel me forward. Fear can be so debilitating. My son recently shared with me a nugget of wisdom gleaned from a friend who broke it down thusly: Everything falls into one of two categories, familiar and unfamiliar. Things that are unknown to us, we fear. BUT, and here’s the good news, once you’ve done that unfamiliar thing there is no longer any need to fear it. You have conquered it and can quite reasonably move it over to the things now familiar to me or “known” silo. It loses it’s power to terrorize you and you can expect that the next time will be easier. For example, the process of writing a book once frightened me, but no longer. God has enabled me to do it twice and now, we’re working on book three. The thought of book signings used to make me want to hide somewhere! But after doing several events, I have a handle on them now. I am not fearless when it comes to such things but I push past the fear because what I’m trying to accomplish is on the other side. I can’t NOT do it. We know from many stories that Peter was brash and bold. He could be cocky at times. But he was a regular person like you and I. His faith could fail. I think any confidence he had was owed to his association with Jesus and not naturally occurring. To step out of the boat required great faith, true, but he was relying on Jesus. When the disciple took his eyes off the Master, he began to sink. Looking to Jesus in the midst of that storm allowed Peter to walk on water. He became his own miracle. Any confidence I have to work miracles or do great things comes from my relationship with God. Peter, like us, could become discouraged or disheartened and give up. But, as in the second scripture example, encouragement from the Lord was all it took to get Peter to try “one mo’ gin.” After a night of fishing and catching NOTHING, Peter obeyed the command and caught more than humanly possible. Jesus is our constant source of encouragement. In His power, we can do more, be more. He stands before us saying: Yes you can. He prods us to go a little bit further. To walk in the dark is to be aware, more than ever, of the presence of, and need for light. Even as a pinprick, it will be evident in it’s display and proof of existence. When light is all around us, more light is hardly a necessity. It is in the darkness that light is made more brilliant and more needful. We lean on it. Search for it. Look to it for illumination and for guidance. Move towards it. Oh, how we need it then! When you walk through a storm, keep your head up high and don’t be afraid of the dark. Walk on, walk on with hope in your heart and you’ll never walk alone. So, don’t fear the destructive power of that storm, I say to myself. Yes, it will tear up some stuff and leave you heartbroken with your loss. But, and here’s the important thing to remember, you will recover. Don’t be afraid of the dark, or the unknown. Though your steps may falter, walk with the sure knowledge that God is with you. Get to the other side where the air, heavy with moisture, smells like fresh rain and vegetation. And you just know all of that rain is a harbinger of good things to come. It is sustenance for the soil, preparing the earth to bring forth new things. Likewise, our storms may be meant to bring to fruition our vision of better days ahead. The Light is here because the spirit of God is within Us.That is why God has assured us to always stay with us no matter what. Yes – He has promised to never leave or forsake us!